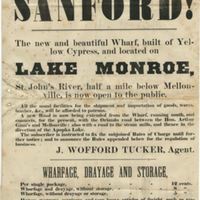 An advertisement for the opening of the wharf in Sanford, Florida. The original Sanford Wharf, built by Henry Shelton Sanford (1823-1891) and Joseph Wofford Tucker (1821-1897), was completed in September 1870. The wharf, made of yellow cypress, was 540 feet in length and cost $2,970. At the end of the wharf was a 30-by-20-foot storehouse. The wharf was built by Sanford to encourage development in the area. However, the wharf itself produced few profits and did little to return Sanford's initial investment. The original structure was destroyed when Lake Monroe flooded in 1871. Much of the wood from the original structure was salvaged by Henry L. DeForest (1857-1902) and a group of Swedish laborers and a new, larger wharf was built in 1872. Original advertisement: box 52, folder 1, subfolder 52.1.1, Henry Shelton Sanford Papers, General Henry S. Sanford Memorial Library, Sanford Museum, Sanford, Florida. Digital reproduction of original advertisement. Henry Shelton Sanford Papers, General Henry S. Sanford Memorial Library, Sanford Museum, Sanford, Florida. Henry Shelton Sanford Papers Collection, RICHES of Central Florida. Fry, Joseph A. Henry S. Sanford: Diplomacy and Business in Nineteenth-Century America. Reno: University of Nevada Press, 1982. St. John's River, half a mile below Mellonville, is now open to the public. All the usual facilities for the shipment and importation of goods, wares, lumber, &c., will be afforded to patrons. A new Road is now being extended from the Wharf, running south, and connects, for the present, with the Orlando road between the Hon. Arthur Ginn's and Mellonville: also with a road to the steam mills, and thence in the direction of Apopka Lake. The subscriber is instructed to fix the subjoined Rates of Charge until further notice; and to announce the Rules appended below for the regulation of business. Per single package, 12 cents. Wharfage and drayage, without storage. 8 "
Wharfage, without drayage or storage, 5 "
Horses, waggons[sic], carriages, and very heavy articles of freight, such as machinery, &c., will be charged at higher rates. 1.—All charges must be invariably, without distinction of persons, be paid in case on delivery of the goods. No departure from this rule must be asked for or expected. 2.—Where importers have pre-paid the steamer's freights, and desire to take away their goods without storing them, they will be allowed the use of the hand-car, not otherwise in use, to bring off their own goods, without any charges for drayage. 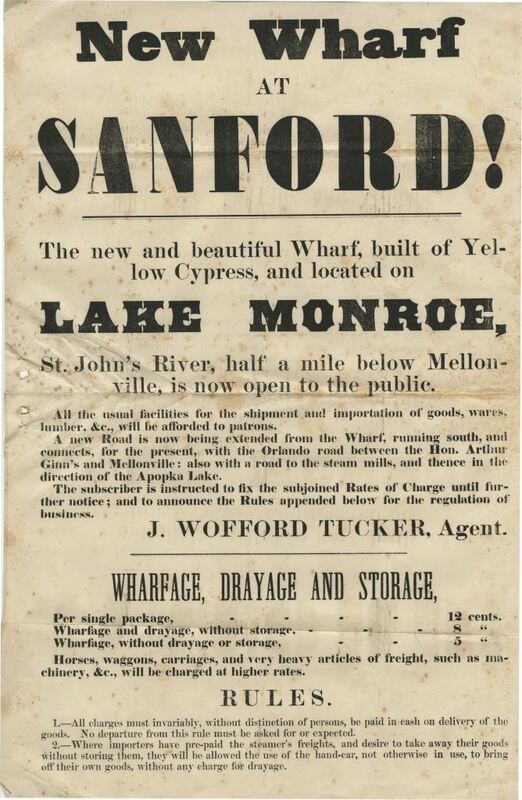 “New Wharf at Sanford!.” RICHES of Central Florida accessed April 23, 2019, https://richesmi.cah.ucf.edu/omeka/items/show/4731.